In previous years, I have summarily pronounced Tabasco as "Nature's Most Perfect Food." This year, with the possibility of shaking things up, I'm putting it in a head to head competition with a couple other great contenders. We'll see how it fares. According to Wikipedia, "Food is that stuff we eat." If that's true, and I believe it is, we have to reason that some of it's likely to be better. That's what we're wanting nail down today, not only which is better but so good it deserves the sterling appellation of "Nature's Most Perfect Food -- 2014." This year, I have three finalists, which I will list in alphabetical order, double-checked for complete impartiality: Bacon, Milk, and Tabasco. The competition will be fair, but I must insist, my decision will be final, certainly through the rest of the year, and until such time, if ever, that my taste buds and/or the inscrutable criterion "Extreme Unction" change. Milk is a weird one, the beverage of mammals, produced right straight from bodies of the female variety. I'm given to understand that milk was my first meal, and was what I subsisted on through much of my first couple years. That's awesome to me, that I was so stuck on one thing. All I wanted was more milk, apparently. I still love it. Bacon is a food we hear a lot about these days. At the current time, there seems to be a huge bacon kick with the public. Of our three foods, bacon is the one that fluctuates the most wildly in price. Cows regularly put out milk and it goes to market, but hog farmers know they've got food-gold, like oil, so the prices are always up and down. And Tabasco is regular as rain -- regular as rain used to be, before global warming. We'll just say now it's regular as Antarctic ice calving. I want to underscore one other thing about bacon, that my love for it has nothing to do with jumping on today's wild bacon bandwagon; I've always had it. I love opening a pack of bacon. It's in there like the pages of a book, and you know it's going to be a taste adventure. Plus, hogs have always been a personal favorite. I've known lots of people who raised hogs, and they depended on people like me for their income. I've seen freshly slaughtered hogs, not a good sight. I've heard hogs being castrated, not a good sound. But I figure any animal that's willing to go through all that, I'm not going to turn away their meat. One of the weirdest hog sights I've ever seen was something like 1,000 baby pigs all together in one room. Just a writhing, seething, heaving, disgusting mass of pig. I remember saying, "Get me the hell out of here!" Milk and bacon, coming from animals, don't sound immediately desirable. But I focus on the finished product, a big glass of cold milk and a plate of nicely cooked bacon. Milk poured well before its spoil date, and bacon not fried to death, but not undercooked. So chewy, so flavorful, so nutritious, so much enjoyable fat that you can't help loving it. Washed down with cold milk. I always loved getting the little milk cartons in school. They only gave us white back in those days, unlike the current more-pampered generation. Then there's my old friend Tabasco. I've made it well known over the years, in real life and on this blog, that I love Tabasco. I've slathered so much Tabasco on things over the years, they really should make me an honorary citizen of Avery Island, my own little cottage, etc. Once I sneezed and had Tabasco way up my sinuses, nearly burning out my system. At the time I thought I would die, but I lived to laugh about it later. These days, though, I've had a harder time with Tabasco. So I'm using less. I seem to be getting more sensitive to it as my aging molecules wither and die. With my mind I love it the same, but my molecules counsel restraint. I don't know what to do. I've always bulldozed ahead with my mind, but it's foolish to cross molecules. If they say they're tearing, straining, and dying, I need to listen, don't I? Or I could simply deny that bad things can happen, like with global warming, and press on full speed ahead. Who's ever heard of negative consequences from anything? The way I'll decide the contest this year is according to the principle of Extreme Unction. Which of the three foods puts the most (and best) unction in my extremities? Right away, it's a contest. Milk, being my earliest (and only) food, obviously kept my extremities nice and rosy. It had no competition and did it alone. But having no competition also suggests an unfair advantage. As far as serving up unction today, yes, I will say milk still does. However, the old advantage is gone. Milk supplements, it's not the main thing. Bacon has tons of unction. And my extremities find it satisfying in virtually every way. The one downside of bacon is that it often overloads my system with guilt. I'm always worrying, Have I cooked too much? Will I get fatter than I want? Should I eat it every meal? Is it bad for me? Still, just thinking of bacon there on the paper towel, the grease being quickly wicked away, leaving those lean strips in a seductive spread eagle pose, I'm always pleased and, even now, feel a tingling in my extremities. Tabasco also carries a lot of unction, up the ying yang unction. Tabasco even makes me feel proud. I know Grandpa would love to see his boy eating a ton of Tabasco. He used to put it on my plate, a drop, and laugh himself to tears watching me trying to get it past my teeth. Then, after his passing, somehow his tolerance of it was transferred to me. So I'm no longer the boy but the man! Like Leonardo's man, my extremities are totally stretched out, and Tabasco hits them all, a bulls-eye every time. But Tabasco, fantastic as it is, is like milk in this one way, supplementary. Yes, occasionally I put it on a plate and lick it up, but not very often anymore. Because of age, the molecules, etc. All three of the great foods have amazing unction, and each one's unction touches the extremities in ways hard to believe, or they wouldn't even be in the running. I tip my hat to all three. 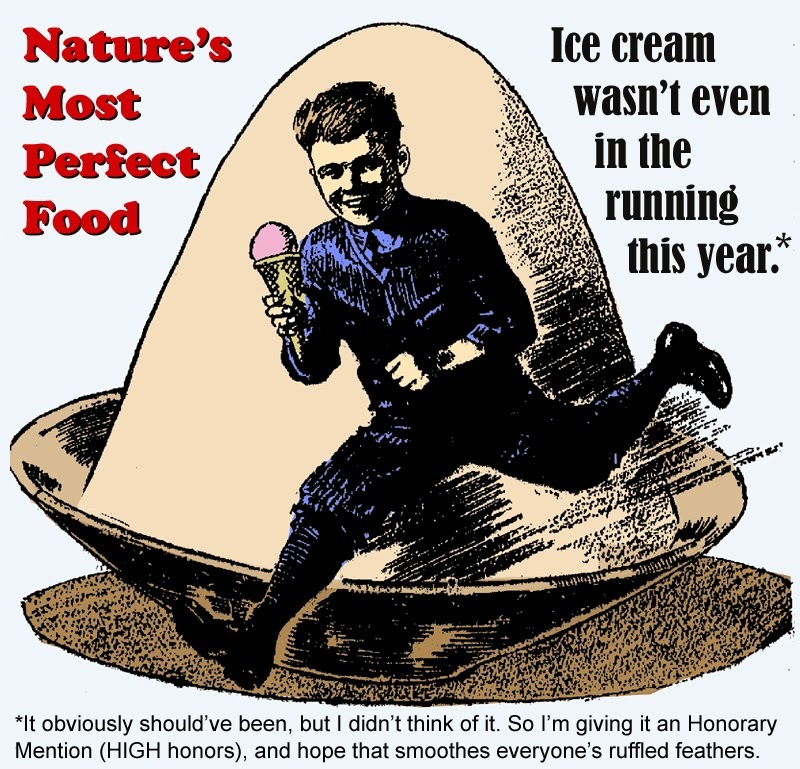 But the one food this year that puts the most Extreme Unction in my extremities, and therefore will hold the title forever of "Nature's Most Perfect Food -- 2014" is going to be .... Bacon!